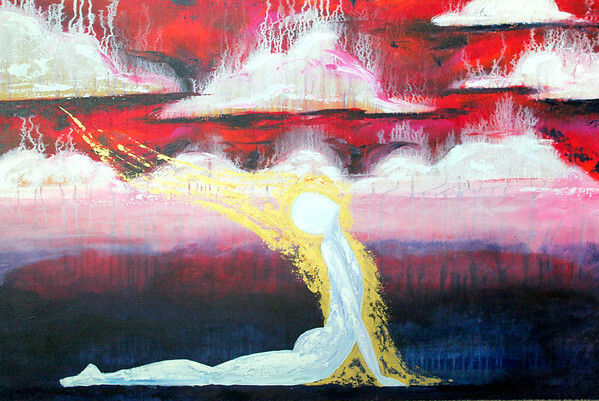 THIS PAINTING IS AN INVITATION TO GREATER VULNERABILITY IN YOUR RELATIONSHIP WITH THE FATHER. YOU HAVE THE CHOICE TO OPEN YOURSELF UP TO HIS LOVE BUT IT IS NOT AN EASY ONE TO MAKE. IT REQUIRES SUCH COURAGEOUS RESOLUTION NOT TO BE SWAYED BY PAST HURTS OR EXPERIENCES. SURRENDERING TO GOD’S AGENDA IN YOUR LIFE MEANS DEALING WITH THINGS YOU MAY RATHER KEEP HIDDEN OR BURIED BUT IN THIS PLACE YOU KEEP YOURSELF FROM GROWING AND HEALING. IT IS TIME TO LET GO AND CHOOSE TO OPEN YOUR HEART TO THE ONE WHO KNOWS IT, MADE IT AND LOVES IT. BE BRAVE AND TRUST HIM.